I add a ribbon or crochet yarn to tie on the baby's head. 1. Many babies are bald! 2. The person holding the baby is too busy to hold on a kippah! 3. You can cut the ribbon/yarn off later and use the small kippah with clips. This size can fit a child while a toddler or even later. 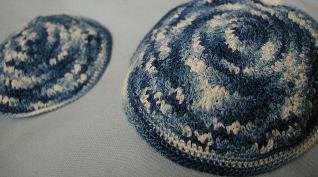 I try and keep these in stock but you can also special order a kippah for the proud father or grandfathers to match! Adult sizes $35.00 and up depending on size. 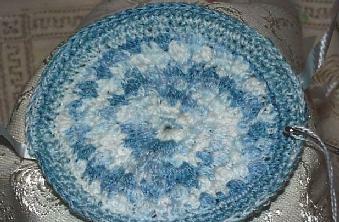 Light blue multi color blue to white. With ribbon to tie on baby's bald head. 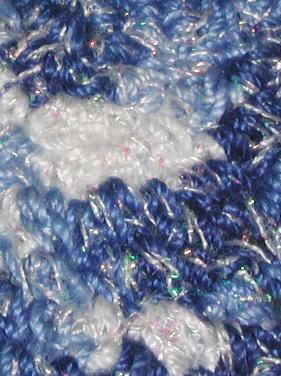 Dark blue multi color blue to white. 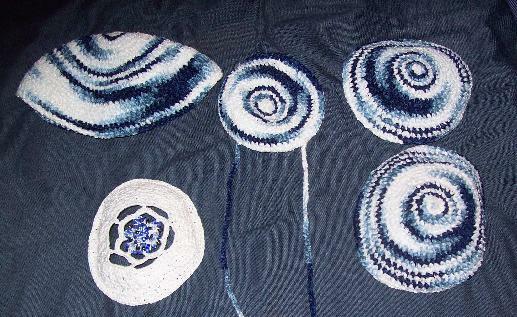 Border of Dark Navy Blue. Father's or grandfathers' matching kippot 6"
Pearlized metallic thread hand twisted into the cotton. Father, grandfather, older brother and brit kippot. 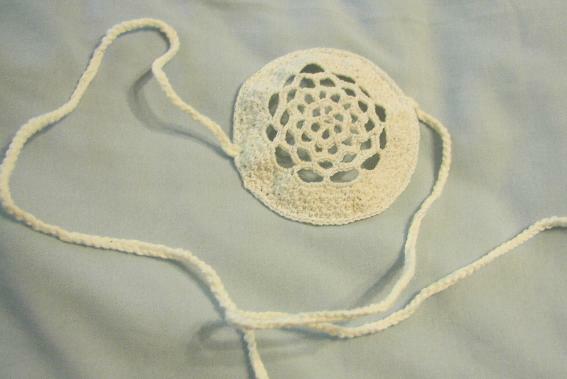 Mother kippah in white pearlized cotton with glass beads. Prices vary by size of kippot. 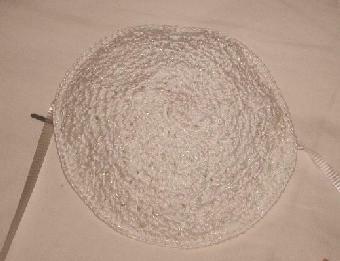 Mother kippah white pearlized cotton with assorted glass beads- 5" $45.00 plus shipping. For those that want a headcover for a baby girl's naming ceremony. for tying for those girl's that don't have enough hair to clip to. 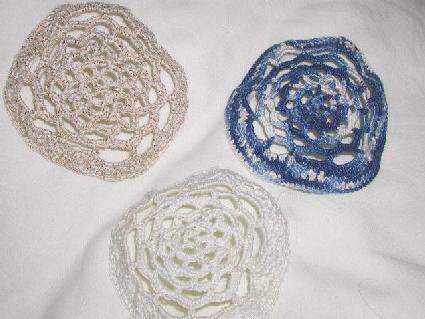 4" hand crocheted cotton lace with removeable white cotton crocheted tie. 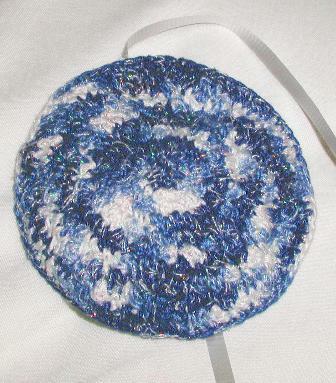 Bris/Brit kippot Or baby naming kippah with white (removeable) ribbon to tie on baby's bald head. 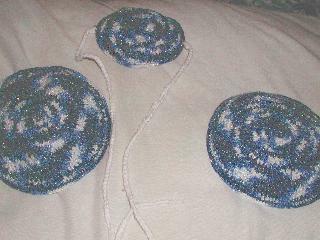 Size Extra small 4 1/2"
All yarmulkahs are priced for a single yarmulkah/kippah and shipping is extra. Eileen generally ships US Post Office priority shipping box for $5.00 for small for USA Shipments. Additional costs for shipping for larger/heavier boxes. All Kippot/Yarmulkas, Scarves, Jewelry and Gifts are priced each plus shipping is extra.